HomePod is an amazing speaker which brings Apple Music and Siri together to learn your taste in music, play what you like, and help you discover music. And as your intelligent home assistant, is capable of handling everyday tasks to controlling your smart home. Can i play Spotify music on a Homepod? I know that Apple Music is required but I still hope that my new Homepod can play the music from my Spotify account. We believe that there are more other Spotify users who share this same wonder. 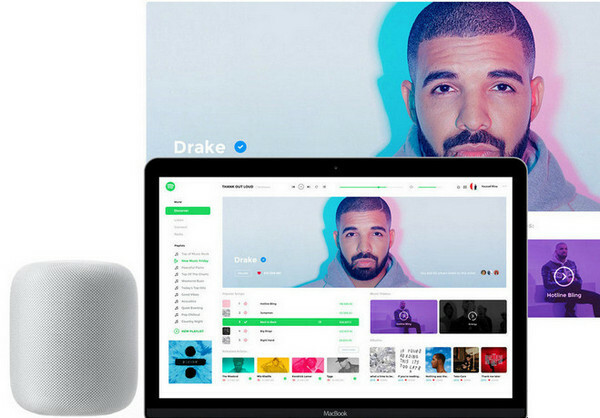 Homepod only plays the audio sources from Apple Music, purchased iTunes music, iCloud music library with an Apple Music or iTunes Match subscription, Beats 1 live radio, Apple podcasts, and today we will show you 2 simple ways to use your Homepod to play the music from Spotify account. You can AirPlay Spotify from your iPhone, iPad, iPod or Mac to the HomePod, but you can't ask Siri on HomePod to play Spotify. So without Apple Music subscription, you miss this pretty significant option. Especially AirPlay 2 will support users to play music with HomePod in more rooms. Launch Spotify music app on your iPhone and play a track > bring up the "Now Playing" screen > tap on "Devices Available" > Select HomePod. You can ask Siri to play music on your iTunes library, so if you do not want to miss the voice control option, you can try to move your music from Spotify account to iTunes library. Because Spotify music is OGG audio file which is protected by DRM (Digital Rights Management), you are not allowed to copy the stuff you purchased to any other devices or players. That is really a problem, but you can go if you can convert the DRM-ed Spotify music to Homepod supported audio formats like MP3, AAC, WAV or FLAC. 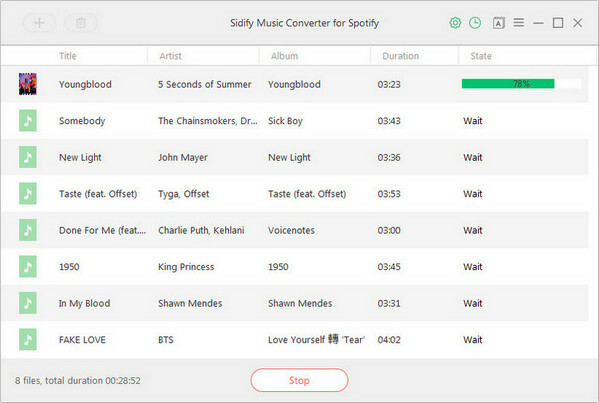 Sidify Music Converter for Spotify would be your life saver now. This Spotify music converter is am effective solution to rip the DRM protection from Spotify contents, and download music or playlists from Spotify to plain MP3, AAC, FLAC or WAV, then it is a piece of cake to play Spotify music on Homepod or any other devices you want. 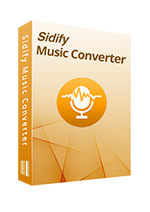 Download and install Sidify Music Converter on your computer, then launch it. 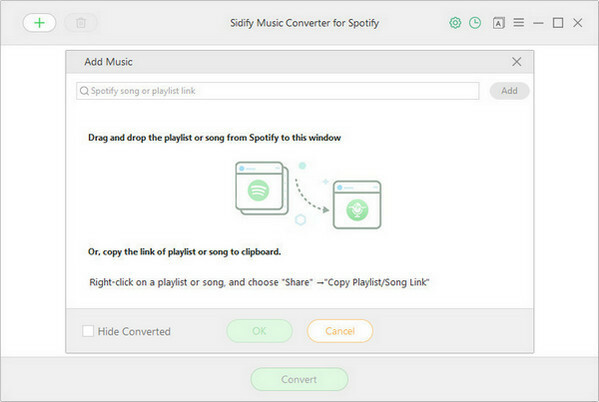 After you launch Sidify Music Converter, Spotify music app will be opened automatically. You can search for the music or playlists you want to download. Head to Sidify Music Converter, and click icon or "Click Here to Add Audio", then a window will pop up to let you add Spotify music. 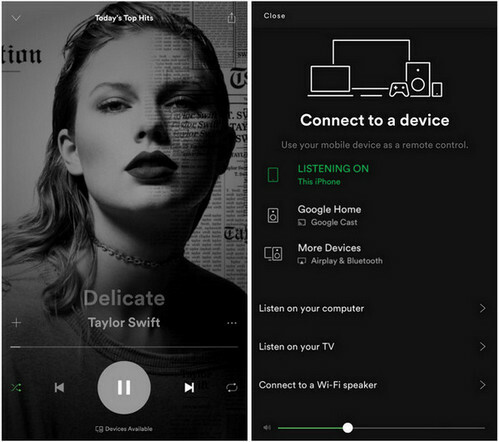 You can drag & drop Spotify music or playlist to this window directly, or you can copy and paste the music URL, then click "OK" and Spotify music you added will be listed on the interface. Then you can click button to choose the output format as MP3, AAC, FLAC, or WAV. If you want to stream the music to Homepod with high sound quality, you can choose the output quality to 320kbps. 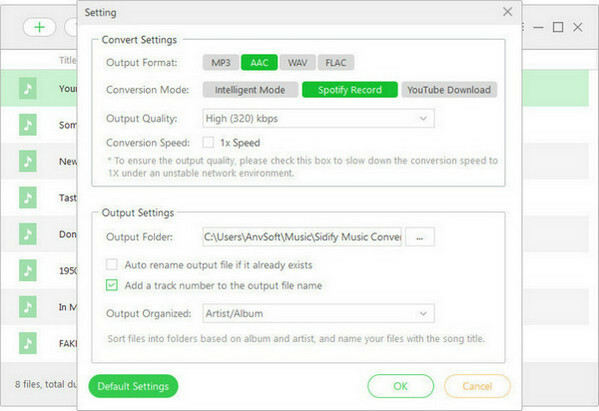 Now, you can click "Convert" button to start downloading Spotify music or playlist to the audio format you chosen. After a cup of coffee, these Spotify music would be successfully downloaded to your local drive. You can click button to check. In order to make use of the voice control to play Spotify music on your Homepod, you need to move Spotify music to iTunes library. Or you can transfer downloaded Spotify music to iPhone, iPad or iPod touch, these music will be saved to default music library, thus you can ask Siri to play them on your Homepod. Though Homepod is launched to enhance the music experience for Apple Music subscribers, with 2 solutions above, you will never worry about how to play your Spotify music on Homepod. If you are not particular about using voice control, Airplay Spotify music to Homepod could please you. But with Sidify Music Converter, you will be pleasantly surprised by the convenience it brings, not just for your Homepod.